A dual axle, low deck vehicle transporter. Our 'Safe Towing Guide' is supplied with every hire. Car trailers are a great way of moving small vehicles when towed by a 4wd or similar vehicle. We have light connectors to suit every type of electrical fitting and we also sell tow balls, ropes, tarpaulins and load covers. 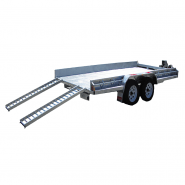 NOTE: Maximum car trailer capacity is 1200kg. NOTE: Car trailers are not for hire outside metropolitan areas. NOTE: Maximum towing speed is 80 km/hr.